Music is a vital part of our St. John’s ministry. Come join us at a 10:30 a.m. service, a Sunday evening Evensong service, or a special musical event and be inspired. The Anglican musical tradition is for music and song to be part of what the congregation offers to God. Sacred Anglican music has been passed down through church history, from the book of Psalms and the canticles of Miriam and Mary, to Christ’s hymn singing after the Last Supper. St. John’s has a rich musical tradition of its own. With almost all Anglican music written for choir, much of it with organ accompaniment, we are blessed to have an acclaimed pipe organ (the sixth St. John’s has had since our inception in 1842). We are also blessed with a semi-professional multigenerational choir, extraordinarily talented musical leadership, as well as accomplished musicians and vocalists in our congregation. With all of these blessings gracing our congregation, we are able to fill our worship services with hymns, chanted psalms, anthems, and organ music. In accordance with Anglican musical tradition, our sacred music is directed towards God as “an outward and visible sign” of the worth we give to God in our worship. Music at the Red Door is a music series that builds bridges between our parish and the community. The name of the series makes reference to our front doors, with their traditional color of welcome and sanctuary. 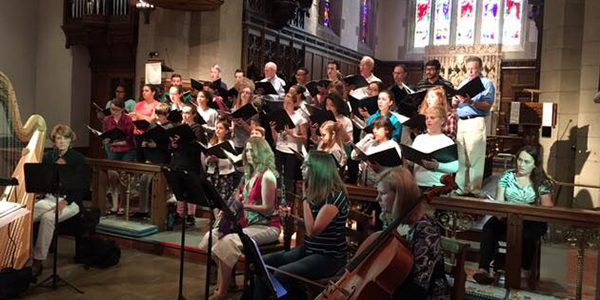 The series has helped to establish St. John’s as a destination for those seeking musical refreshment and excellence, drawing on the existing strengths of our choirs and guest artists, architecture, organ, location, and Anglican heritage. 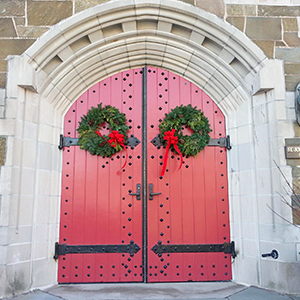 Each year program year (September to June), Music at the Red Door offers concerts in a variety of styles, from traditional organ and choral music to gospel, jazz and a cappella music, along with special worship services, such as Choral Evensong on the last Sunday of most months, and an Advent Candlelight Festival of Nine Lessons and Carols. Click here to learn more.